Dendrochilum orchids are mainly epiphytic and lithophtic, although some species are terrestrial. 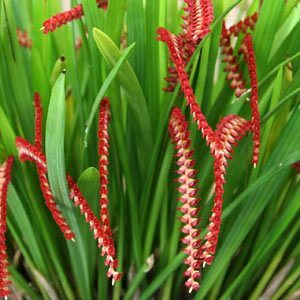 Dendrochilum Orchids are native to Borneo, The Philippines and surrounding countries. The natural habitat is on trees where they attach themselves to the mossy surfaces. The moss retains good moisture, and as they grow in elevated forest areas they are also subject to moist air conditions for much of the time. They are an orchid that requires good light and will take direct sun for part of the day. They also are naturally subjected to windy conditions, so good air flow is another important factor. With an increasing number of species being cultivated this fascinating and attractive group of orchids is becoming more accessible to the home grower. The over 300 Denrochilum orchid species include Dendrochilum cobbianum, Dendrochilum saccolabium (see picture top right) Dendrochilum wenzelii, Dendrochilum tenellum and others. 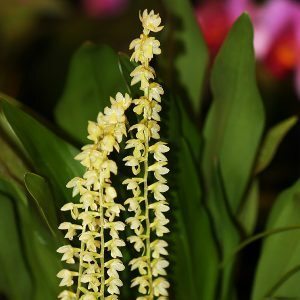 Requiring humidity shade and moisture Dendrochilum species are fairly easy to grow with Dendrochilum wenzelii perhaps being the most forgiving. Firstly determine if the particular species is one that is suited to growing in containers or is one that is fussy and really needs to be mounted. Then find out if you have one of the species that grows in direct sun or one that prefers filtered light. Watering is the main issue with container grown species preferring to be watered from below, many growers submerse the whole pot in water for a few hours avoiding watering the foliage directly although they do mist it at the same time. Allow to dry out a fair bit between waterings. A light feeding with a specialist orchid fertilizer at the beginning of the growing season is all that is required.